Water which is left longer than 4 months can harbour harmful chemicals and bacteria, as well as over exposing the water to old and used sanitisers. This is harmful, unsanitary and dangerous to your health and well-being. Here at Platinum Hot Tubs Essex, we understand how busy life can be. Therefore we provide several service packages that enable us to drain and clean your hot tub, so you can have a hygienic and efficient tub to enjoy. The first thing to do is to turn off your hot tub heater and switch it off at the main supply. You should then look for the circuit breaker for your hot tub and make sure you turn that off also. 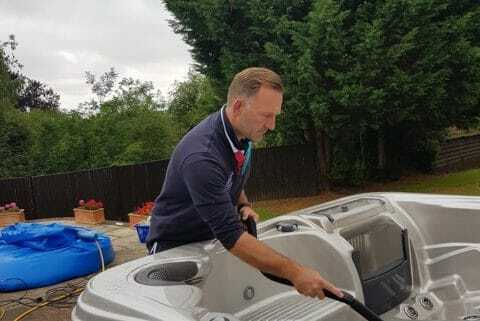 Safety is paramount when dealing with water and electrics and it is dangerous to attempt any draining or cleaning of your hot tub without following these steps. Before you drain your hot tub, you must run a flush line through it to remove harmful bacteria. The majority of grime, dirt and bacteria lives inside the pipes and plumbing lines under a layer of substance called biofilm. This biofilm sticks to the surfaces of your hot tub and it is in contact with the water. This can harbour many harmful substances such as, E-Coli, Legionella and many more. Draining your hot tub without cleaning away the biofilm will just transfer all the same bacteria into the new water. Next you should remove the filter and wash it under a tap to remove any dirt or grime. A replacement filter is only needed if it is damaged or shows signs of bad wear and tear. If you are planning on refilling the hot tub immediately after cleaning it, then you will need to put the filter back in before adding new water, unless you are packing it away. To drain your hot tub, simply add a garden hose on to the drain spout at the bottom of the tub and ensure it is on the spigot firmly and tightly. You should then open the spigot and the water will then start to drain out of the tub. It is best to make sure that the end of your hose is in a part of your garden that will not flood. Once your hot tub is empty, use a mop or towel to soak up any remaining water so it can be ready to clean. If the hot tub is being packed away for winter, then it is important to make sure it is completely dry, the cover is attached and the filter is removed until it is ready to be set up again. Whether you are replacing the water or packing it away for winter, draining your hot tub correctly is vital to its efficiency and hygiene. 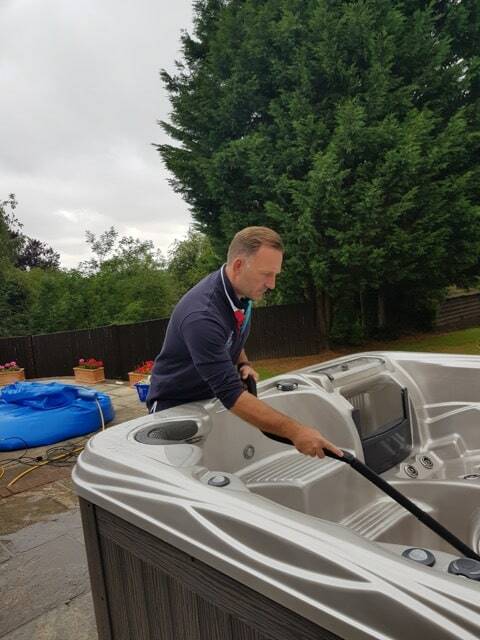 If you have any questions or concerns about draining your tub then please don’t hesitate to contact us here at Platinum Hot Tubs Essex, where we will be happy to help. We also have a showroom featuring all our premium hot tubs for you to view. We look forward to hearing from you.